The CH-54 Tarhe was a twin-engine heavy-lift helicopter designed by Sikorsky Aircraft for the United States Army. It is named after the Tarhe Native American people. 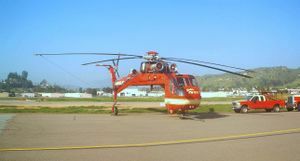 The civil version was the S-64 Skycrane. Initial work on the Sikorsky 'sky-crane' helicopters began in 1958 with the S-60. The S-60 was a piston-engined prototype that was equipped with an autopilot for stable hover, and featured a skeletal fuselage with a crew cockpit; the copilot could swivel his seat to face both fore and aft, and control it from either position. The skeletal nature of the helicopter allowed it to carry customizable, underslung 'modules' - nearly 100 troops, a medical outpost, a radar structure, etc. 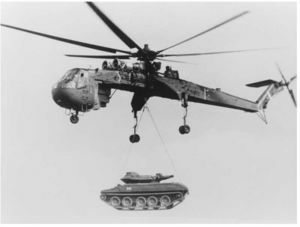 CH-54 carrying an M551 Sheridan tank on a sling mount during transmission testing for the CH-54B. The first flight of the turboshaft-powered S-64 Skycrane was May 9, 1962, with the U.S. Army eventually purchasing 105. Used in Vietnam for transport and downed-aircraft retrieval, it was highly successful, thanks to the 'adaptable' nature of the module system first conceived by General James M. Gavin in his book "Airborne Warfare" in 1947. Early pods could not carry troops and external sling-loads at the same time but the follow-on Boeing XCH-62 crane type heavy lift helicopter (HLH) solved this by having a larger compartment to carry passengers in addition to a slung load. Advanced pods for the CH-54 could carry troops and cargo underslung at the same time but were not purchased. Skycranes can not only hold their cargos up and tight against its center spine so there's less drag and no pendulum effect when flying forward, they can winch these vehicles up and down from a hover, so the helicopter itself need not land. Due to budget cuts the HLH program was cancelled and the CH-54s not upgraded with larger engines. Boeing CH-47 Chinook gradually supplemented it in combat, although Skycranes remained in U.S. National Guard service until the early 1990s. 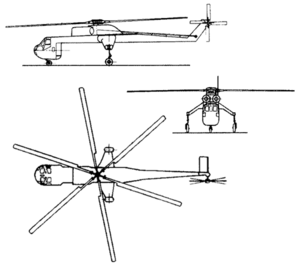 The Soviet Union also created much larger crane helicopters with a similar skeletal design. The Sikorsky S-65 (CH-53 series) Stallions were designed with multimission capabilities in mind, but Navy program managers decided not to exploit the CH-54's crane type minimalist efficiencies. The purchased CH-53s proved extremely costly to operate, and suffer from less lifting capacity as they carry around 6 tons of empty fuselage weight. The CH-53E failed to provide the ISO shipping container air transport the Army wanted with its HLH requirements, and today cannot carry 20-ton loads to meet Joint service Sea Basing requirements. Sikorsky S-64E, Andy's Pride, owned by Siller Bros. Inc.
Today, Erickson Air-Crane, Central Point, Oregon, USA, operates the largest fleet of S-64 helicopters in the world under the name Erickson S-64 Aircrane, which can be equipped with water-bombing equipment for firefighting duties worldwide. After obtaining the type certificate and manufacturing rights in 1992, Erickson remains the manufacturer and world’s largest operator of S-64s. Erickson is making new S-64s from scratch to meet the needs of the firefighting and logging industries; thus the U.S. military could re-introduce new up-engined Skycranes to meet their 20-ton Sea Basing requirements. Erickson began the tradition of giving each S-64 an individual name, the most well known being "Elvis" used in fighting fires in Australia. Others operators, such as Siller Brothers have followed suit with their Sikorsky S-64E Andy's Pride shown in the adjoining picture. One Erickson S-64E nicknamed "Olga" was used to lift the top section of the CN Tower into place. ↑ Donald, D. (1997). Sikorsky S-64 / CH-54 “Tarhe” helicopter. The Complete Encyclopedia of World Aircraft. Retrieved on 2006-10-08. This page was last edited on 6 March 2007, at 01:31.